Did you know that falls are the leading cause of injury among people age 65 and older? According to statistics, on average, an older adult in Ohio falls every minute! Falls are not a normal part of aging and can be prevented. 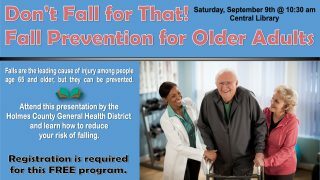 Attend this presentation by the Holmes County General Health District and learn how you can reduce your risk of falling by becoming more aware of fall hazards. Registration is required for this FREE program. Stop by the Central Library or call for more details.